OK, your budget is on the chopping block, you are looking at layoffs, closing stations, and reducing services. Who do you turn to? Who is your first line of defense? I have heard them called by a number of terms, citizens, mortgage holders, voters, taxpayers, the public, stakeholders, customers, and the community at large. To take it down a notch, these are the people who live within your service area. If you have taken the occasion to spend some time with these folks, they can be a powerful ally in your survivability. Of all of the services provided by government, the fire service continues to be one of the most misunderstood. While the media has done quite a bit to enhance the image of the American fire service, we are still not doing enough in our own departments to show the people and the elected officials that we are providing a viable and needed service to the community. Let’s take a look at all of hubbub surrounding “community policing.” While this “buzzword” may be modernistic to the cops, it is a concept that has been embraced by the American fire service for the last 350 years. Fire departments, since Peter Stuyvesant organized the first one in 1647, have served as the heart of many neighborhoods. What the police have accomplished is nothing more than a great marketing job. As we forge into the future, we cannot forget the lessons that we have learned from the past. Three centuries ago the citizens of a community banded together in order to form the first line of defense against fire. Much the same holds true today. The first line of defense in a fire department’s ability to persevere is still the citizens, and we have a moral obligation to educate them as to who we are and what we do. One of the key concepts here is to maintain a synergistic approach when you are integrating marketing strategies into your operations. We have to take a step back and make sure that all of our initiatives fit into the big picture, and that it all works together. Synergy is just that, the action of two or more items (like a department’s training program and the marketing of it) working to achieve an effect of which each is individually incapable. That greater effect must tie back into your mission. Effective fire service leaders take every opportunity presented to them to let the community know what the fire department is doing for them today. Putting the pieces together to market the department’s services is nothing more than recognizing when these opportunities present themselves, and doing something to keep the fire department in the public’s eye. If we check Webster’s Ninth New Collegiate Dictionary, we note that marketing is “an aggregate of functions involved in moving goods from producer to consumer.” If we think of the goods in the form of fire department services, marketing is the role taken in letting the public know what we offer. Keep in mind that the entire concept can be a bit elusive. Pick up any fire department management text and turn to the index. Look for the section on marketing fire department services and what do you find? Nothing! This is not to say that any of these books do not contain a great deal of information on marketing, you just have to know where to go to look for it. Most texts contain some sort of information on media relations, community relations, and public fire safety education. The trick is in researching some of what fire departments have accomplished in the past, and thinking about expanding these traditional public contacts into “plugs” for the services that we are providing. * The department’s viability and survivability. * Providing higher visibility in the community. * Improved communications with internal and external customers. * Creating an understanding as to the department’s services, costs and benefits, and culture. All of these items cannot stand alone, and ignore how the department provides services and the underlying theme of meeting the goals of the organization. Recognizing that fact and utilizing a synergistic approach to marketing will assist us in accomplishing our mission. A shift has taken place over the past few years in the use of the media in providing the fire prevention and safety slant in the reporting of fire incidents. Prior to that we stressed the number of alarms, personnel on the scene, amount of water flowed, and the cause of the fire. We are now seeing information on how smoke detectors woke a family and allowed then time to escape, or how fixed fire protection features held losses to a minimum. We must now do the same for all of the services that we as fire departments provide. Think about citizen-initiated CPR making the difference in saving a life and how that training was provided by the fire department. How about a confined space rescue that was successful because of the changes in types of service and the additional training and equipment that the department has taken on. Are we doing the most in providing information on what we do when we respond to a Carbon Monoxide alarm? Your average citizen has no idea that the fire department does more that show up when your house is on fire or someone is hurt. It is up to us to use whatever methods we have available to change that. One of the most successful and low cost marketing techniques that a department can utilize is the development of a good working relationship with the media. I am certainly not crass enough to tell you that I came up with all of these great marketing ideas on my own. I do however have the good sense to steal ideas from some folks who have come up with some great programs. When it came to overhauling media relations for the Farmington Fire Department, a media guide that was developed by the Eugene, OR Fire Department looked like a great place to start. After coming to the realization that what most people know about their fire department comes from the media, we set our sights on educating these folks about who we are, what we do, and what we can provide to them in the way of information and assistance. The guide provides an informative look at the services the department affords, explanations on what reporters may be seeing on the fireground or emergency scene, and how to access information during and after an incident. A glossary on fire department terms is also included in the guide. What had started out as the adjustment of a document that another fire department had developed has lead to a greater use of Public Information Officers at incident scenes. Another offshoot has been the hosting of a “media luncheon,” to assure that this partnership remains in place, and to educate new folks as turnover takes place. It also allows us to identify the special needs of the different types of news gathering agencies. This includes getting good photos/video of incidents, as well as what type of deadlines these people are up against. The return on this investment has been tremendous, and has solved numerous problems in keeping the media from seeking information from uninformed sources. The benefit of having the media assist us in educating our customers assists us in integrating our other programs and their associated marketing efforts into the big picture of providing the best service to the community. Another extremely successful marketing program is Farmington’s Citizens Fire Academy. To again give credit where credit is due, we built upon the accomplishments of the Orlando and Temple Terrace, FL as well the Baytown, TX Fire Departments’ programs. The feedback that we have received from the citizen groups that we have put through the academy has been a real eye opener. The common theme of all the comments received has been that these people had no idea as to the variety of services that the fire department provides. We went into the development of this project with the thought in mind of familiarizing the participants with the services and operations of the department, as well as providing information on basic fire and life safety behaviors. The objectives of the academy include the knowledge of the department’s services and operations, as well as having the graduates become a conduit of information back to the community as to what is going on with the department. Through the curriculum, the attendees have developed an appreciation and understanding of the culture and diversity of today’s fire service. This is all achieved through a series of interactive lectures, and a lot of hands on activities. Through the student evaluations that have been provided to us, the program now consists of one three hour session per week, for eight weeks. The major content areas cover an overview of the department and fire service history; emergency medical services; personal protective equipment and self-contained breathing apparatus; fire science; and the incident command system. Other subjects include auto extrication; technical rescue; fire prevention; fire & life safety education; fire investigation; aircraft rescue and firefighting; handling fire streams, nozzles, and appliances; and hazardous materials incident mitigation. All of this training culminates into a controlled interior and liquefied petroleum gas fire attack at our regional training facility. It has been our experience that the more hands-on training we provide, the more the participants love it. We have also taken this program a step further, in allowing alumni of the academy to come back and join us in our fire and life safety educational events, as well as our ride-along program. This allows us to continue and build upon the relationships that have been developed over the eight-week period. While we attempt to keep the academy open to all members of the community, we have targeted the participation of civic leaders, representatives of the media, and personnel from other agencies that we interact with (such as telecommunicators from our county wide public safety communications center). Farmington’s Citizens Fire Academy has been so successful we now plan on running the program in the spring and fall. This effort becomes a model for providing information to our stakeholders on how everything we do and who we are forms the culture of our organizations. From the way your informational handouts look, to the methods that you employ to get this information to the public, these programs provide a great opportunity to market the department. A number of years ago we shifted to the use of clowns in delivering the fire and life safety message to the children of Farmington. Through this change we found that we must have been boring the kids to death when we were just lecturing to them, and have now developed one of the most requested programs that the fire department has ever been involved in. Programs advanced around audience specific groups also show that the fire department is taking the extra steps to address the needs of the community. Knowing who the “at risk” population is in your community, and addressing the demographics of the make up of your citizens will allow you to make the marketing message specific to the targeted group. Along with this is the addition of life safety information, and accident prevention education in the message we take to the public. As with all of the different marketing programs and strategies, you are only limited by your imagination in what message you take to the streets, and the methods used to get the information across. Thinking outside of the box has allowed the Farmington Fire Department to become involved in non-traditional programs such as Project KidCare. While this type of program may not have anything to do with our traditional role as it relates to community contact, it provides yet another opportunity to keep the good name of the fire department in the forefront. The key here is being able to see the forest through the trees, or looking at potential pitfalls as opportunities to let your community know what the fire department is doing for them. Having everyone in your organization understand what the basic purpose and the mission of the department is a great place to start. Without this, failing community support, lack of confidence in the fire department and the level of service provided can easily take place. If we do not take the opportunity to educate the public about the department at every turn in the road, misperception can become reality. Image is everything. “Every employee is an advertisement for the fire department and its quality of service. Personnel can be the fire department’s best or worst marketing tool,” noted Garry Briese of the International Association of Fire Chiefs in a 1990 article from Chief Fire Executive. Every time we come into contact with the public, our customers are evaluating us. Treating others as we would like to be treated ourselves seems kind of basic, but it will go a long way to enhancing the image of the fire service. While we have been making great strides in providing speakers for fire safety presentations, we need to make the jump into doing the same for marketing the department. We have been the “silent service” for way too long. What is stopping us from showing up at a Rotary luncheon with a Power Point presentation on what services the fire department is providing to the community? Tradition? Fear? We have to market ourselves to the public. If we don’t, we have the potential of being “downsized” right out of sight. Good customer services parallels a good marketing program. The recent awakening of the fire service to the customer’s needs during and after any emergency will go leaps and bounds in marketing your fire department and its services. Instead of having to read my reiteration of what good customer service/fire department marketing consists of, I would encourage you to get your hands on a copy of Essentials of Fire Department Customer Service, by Phoenix Fire Chief Alan V. Brunacini. Chief Brunacini does an outstanding job of outlining eight opportunity categories as they relate to what we all should be doing in the way of serving our customers. Excellence in customer service will equate to word-of-mouth marketing that no program or money can provide. Some of the more traditional marketing concepts utilized by the private sector can easily be converted into use by fire departments. Amazingly enough, most of the concepts I have discovered have a direct tie-in to customer service. We have to take the best practices and successes that these folks provide and integrate them into our efforts. Relationship marketing relates to what we do for the public beyond our initial contact at an emergency situation. Some excellent examples of this practice present themselves in departments that take the extra step in assisting folks after the emergency is over. Providing information on what people need to do after a fire, to making sure that a persons home is secure after being transported to the hospital are just some of the simple things that can be done within this approach. Customer driven marketing contains strategies that have the most direct tie-in to “customer service” issues. The tactics employed in this method include making sure that your internal customers (employees) are functional and that the organization is happy and healthy. It would not be an ideal time to start this process if the organization is dysfunctional, major moral problems exist, or you have waited until the last minute of facing cuts and you try to use this to pull a rabbit out of your hat. This one takes some time to piece together. The second step in this process involves some change management philosophy. Having your troops awareness of the importance of the customer in the survival scheme heightened is one part. Making the transition into doing the little things to improve the department’s image or educate folks about what the department does through its public contacts is the other. The next, and most critical phase of this method, is forming partnerships with the public. This tactic can be easily accomplished through joint fire safety presentations, or incorporating public contacts through the events that others have scheduled. In this aspect, you are once again only limited by your imagination. One simple method utilized by the Farmington Fire Department to increase exposure and form partnerships is the deployment of two firefighter/EMTs on bicycles at large scale public events. The tried and true marketing technique of customer satisfaction must not be overlooked. Identifying who the customer is and what needs they have is the first step. Pinning down how we can best serve them would be next. Facts and figures on the cost/benefit analysis of providing services would be the final step in this agenda. Feedback from the public will be critical in putting together the pieces of this particular puzzle. Information gained from surveys, meetings, and any public contact will assist you in collecting data for the first two items identified. The last portion is in place to assure that you are providing the most bang for the buck in services, and letting the community know what a great deal they have going. Promotional marketing would include components such as a department newsletter, various advertising media, or perhaps an Internet home page. These types of items provide outstanding examples of this scheme. The newsletter published by the Farmington Fire Department started out as a tool to assist in intra-departmental communication. At this point in time it now enjoys a large circulation throughout various city departments, alumni of our citizens fire academy, as well as other fire departments in the region. What a great tool to use to let people know who you are, and what you are doing for them. Are we blowing our own horn? You bet we are, because if we don’t, nobody else will. Plans are now in the works to incorporate the newsletter into our home page on the web. Advertising media may include trading cards, key chains, pens, book covers, and the other items we distribute to the public. Specialized marketing techniques such as bilingual public service announcements, and handouts will assist in targeting various portions of your customer base. Targeting high fire risk groups such as the very young, senior citizens, and low-income families are examples of these specialized techniques in action. One common thread runs throughout making these lessons from the private sector work together. That thread is employee commitment to the various programs. Participative management strategies and change management instruments must be utilized to allow the folks who will be making the day-to-day contacts to buy-in to whatever path to better marketing you choose to take. The participation of everyone in the organization in the development of a marketing plan or program will allow for that buy in, as well as forming the image that should be portrayed while out in the community. Our internal customers are critical factor in marketing success. In these days of “downsizing,” the synergistic approach should serve in keeping our first line of defense intact. Birr, Tim. (1987). Improving fire department/media relations. Firehouse, pp. 65-65. Brunacini, Alan V. (1996). Essentials of fire department customer service. Stillwater, OK: Fire Protection Publications. Bruno, Hal. (1978). Educating the media. Firehouse, p. 18 Cole, P. & Wayland, R. (1994). Turn customer service into customer profitability. Management Review, pp. 22-24. Gasaway, Richard B. (1997). Analysis of marketing and public relations programs initiated by the Springfield fire department. Emmitsburg, MD: National Fire Academy. Keefe, Thomas P. (1984). Effectively marketing your department to the public. American Fire Journal, pp. 16-18. Levine, J. (1993). Relationship marketing. Forbes, pp. 232-234. Naumann, E. & Shannon, P. (1992). What is customer driven marketing? Business Horizons, pp. 44-52. Schumacher, J. & Quinsey, R. (1990). How to market a fire department. Chief Fire Executive, pp. 48-50. Thomas W. Aurnhammer is a twenty-four year fire service veteran. Starting in 1976, Aurnhammer became a paid-on-call member of the Millburn, New Jersey Fire Department, and at the same time served as an auxiliary member of the Newark, New Jersey Fire Department. In 1980 he became a Career Firefighter for the Farmington, New Mexico Fire Department, and since has held the ranks of Fire Engineer, Fire Captain, Fire Marshal, and his current position of Fire Chief. Chief Aurnhammer holds an Associate Degree, with an emphasis in Fire Protection, from San Juan College, and is a graduate of the National Fire Academy’s Executive Fire Officer Program. He has also attended numerous resident programs at the National Fire Academy, as well as a number of regional seminars and workshops on a variety of fire service subjects. Chief Aurnhammer has instructed classes on the local, state, and federal levels. Many of his articles on fire investigations and fire department management have been published in national trade journals. 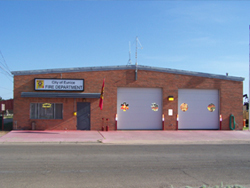 Chief Aurnhammer serves as a member of the adjunct facility at the National Fire Academy in Emmitsburg, MD as well as the New Mexico Firefighters Training Academy in Socorro, NM. He is also a Licensed Emergency Medical Technician and a Certified Fire Investigator through the International Association of Arson Investigators.